Big Finish’s 2017 Monthly Range kicks off with ‘The Star Men,’ welcoming Matthew Waterhouse’s Adric back to the TARDIS alongside Peter Davison’s Fifth Doctor, Sarah Sutton’s Nyssa, and Janet Fielding’s Tegan to once again fully delve into season nineteen. Blending the more character-driven plotlines of recent years with the overall stylings and tone of the classic series, ‘The Star Men’ begins to better round out the sometimes aloof and distant character of Adric while finally beginning to fill the distinctly Adric-sized hole in this range. After not having much success teaching Adric to navigate the TARDIS, the Doctor decides to visit Gallius Ultima to aid in Adric’s studies of astronomy. As usual, though, the TARDIS arrives at the height of a crisis, one that should not be happening as the first interstellar Leap Drive experiment inexplicably is not the resounding success that is recorded in the history books. 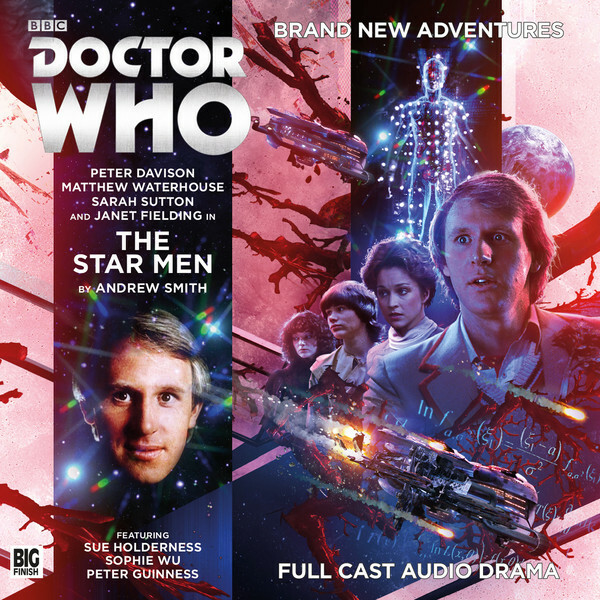 As the Doctor and Tegan retrace the failed mission’s steps aboard a military craft, the titular Star Men are revealed in several forms both at Gallius Ultima and along the ship’s path, and they instantly make their incredibly menacing presence known. A truly elemental force with an insatiable requirement for energy that necessitates the continued expansion of their realm, the Star Men’s threat in all of its various forms makes this new race one of the most powerful in Doctor Who’s robust catalogue, and they certainly warrant further exploration in future releases. Given how complex the creatures and their various forms are, the script of ‘The Star Men’ avoids ever becoming too muddled as it deftly keeps events quickly moving forward in a logical manner. Unfortunately, as strong as the action and tension are at the two afore-mentioned locales, events do slow down just a bit once Tegan is taken and the Star Men’s original and all-but-lifeless universe more overtly comes into focus. This shift does help to better exemplify the long-term ramifications of the Star Men’s need for energy while introducing the all-important Core and the means to victory, but the pacing here is just a bit off compared to the momentous pacing elsewhere with the Star Men directly a menace. Even with the split action, Adric is very much the character more in focus here, and Matthew Waterhouse does well in portraying a slightly softer though still incredibly driven Adric. The classic series rarely delved into relationships or true personal turmoil, but ‘The Star Men’ features Adric in the centre of a burgeoning romance with Sophie Wu’s Autumn, though humorously one he does not realize or accept is developing despite Autumn’s rather overt advances until quite late in the game. This is a side of Adric, in particular, that was not touched upon originally, and it’s fascinating to see Adric interact with someone like him on a more intimate level while still putting to excellent use his celebrated mathematical prowess. These more intimate scenes form a nice calm from the incessant disaster and action around them, greatly humanizing Adric in the process. The balancing of storylines and locations is the greatest strength of ‘The Star Men’ as it confidently introduces an incredibly powerful new foe. However, although all of these storylines diverge and later converge perfectly naturally and understandably as every character is put through the wringer, the resolution does feel somewhat rushed. So much work is done in explaining and developing the threat in all of its forms on all of its fronts that, once the beachhead is closed, no time is given to explore the emotional fallout. With one death in particular, even an extra five minutes or so could have greatly aided this release to adequately address the personal consequences and implications. Still, the quick resolution is certainly true to many classic Doctor Who serials where the Doctor quickly makes his exit, but fortunately ‘The Star Men’ as a whole is a strong start to 2017 and a strong re-introduction of Adric by the man who first wrote for him, Andrew Smith.